Please Help Me To Improve My Landings. I fly off this strip. It's eighty metres long by ten metres wide. To the left as we look at it is a "glider strip" of well-mown grass at least twenty metres wide. Beyond the runway the fields are sown to various crops, this year both fields were sown to wheat which has recently been harvested. My landings have never been my strong suit but my approaches have improved partly with the advice received from fellow forumites. I have a problem with depth perception or is it spatial awareness? Twice this season I have landed a model in the ploughed field when I thought that it was going to land on the tarmac. In the first instance I broke the fuselage of my Baron 1914 and yesterday I ripped the undercarriage mounting plate out of my SLEC Fun Fly. Is there anything I can do to improve my spatial awareness? Depth perception, is probably our weakest human asset, and we all suffer this one. What we can do is improve something you mentioned, the approach. Whereby you are not fighting to loose speed or height coming towards yourself. Coming towards yourself, maintain the controls gently just to keep the wings level and come in. Also, don't give yourself too much to do by going miles downwind buying you time. Don't wear varifocal glasses or rush your approach to land, at worst come in slightly high and do a low pass to check where about the aircraft actually is compared with where you think it is (as it flies in front of you). I have miss interpreted the "scale" of the odd model and thought it was much closer that it actually was! Another club flier has two models that are near identical apart from one that is twice the wingspan of the other. Doing his low circuits around the field with the larger model he clipped the hedge/put it in. He thought as it looked large thus it was closer than it actually was! I have a PZ Habu EDF that has a quite large speed flight envelope and the advice given to me that works is to do a circuit and 1/2 throttle to bleed the speed off and importantly become accustomed to the low speed to get a nice landing. Again there is pressure as flight time is 4 minutes which does not give me many go around to get it right! Might be worth practicing a few touch and goes with each model just to get your eye in on the size and position of the model. Now I’m glad you’ve brought that up DD, as it appears to be a common problem affecting, not all, but a lot of us! We too fly off a tarmac strip with a grass one running alongside it which the full size boys use. When I first started flying I was always landing too far out, on the grass until a club member gave me some reference points to line up with on finals. I now, very rarely, miss the tarmac but, and here’s the rub, trying to land down the middle of the grass strip is a big problem, in fact on the 3rd flight of my new Radial Rocket I was right on the far edge of the grass strip, so much so that one wheel caught in the rough, spinning her round and pulling one leg out. The further away we fly, the more we lose the sense of the relationship between the model and the ground. When I was being tested for my CAA drone flying, one of the things the instructor told me to do was to fly 200m away by my judgment (without looking at the screen) then to hover and look at the screen. It was interesting to see how accurate, or not, my judgment was. Ditto height. We then carried out the same exercises but much further away and the difference was quite considerable. My suggestion would be to look for reference points, as per above, and use those to help line up etc. Thank you gentlemen for the immediate and helpful replies. As for reference points if you look at the picture you can see a very tall dead tree in the distance. This lines up with the white lines in the centre of our runway. In the opposite direction there are a pair of pine trees which provide a similar refernce point. I think that Denis may have nailed my problem. I fly too far on the downwind, then having turned crosswind and then onto finals, spend ages approaching the strip at slow speed. Frequently I am at the point of a stall and have to push in down and give a blip of throttle. I'll try turning sooner and keeping the speed up. David, where do you stand and where was this ploughed field? I ask because I can see no hint of a ploughed field in the photo which might suggest you were miles off? The club's flying field extends perhaps two or three metres beyond each end of the tarmac strip. After that there are fields which are worked by two different farmers. It's not obvious in the photo because the ground slopes away downwards from the runway in this direction. 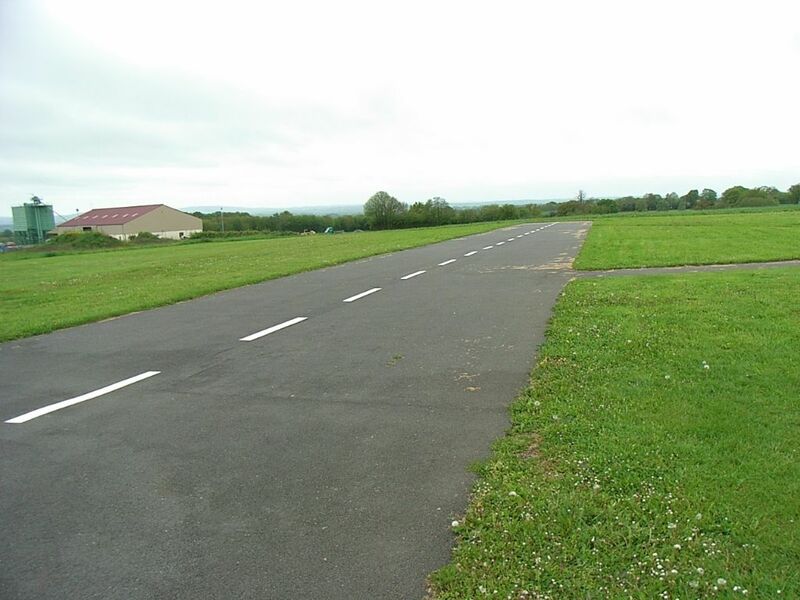 As for where we stand, if you look at the photo you will see a tarmac footpath running from the runway to the right. There is another one about thirty metres further on. These footpaths converge at the pit area which is out of shot, but they encase a grass triangle. We stand in the grass triangle about two or three metres away from the edge of the runway. I'm curious, why shouldn't you wear varifocal glasses? We have a square of mown grass about 100 meters square. While landing on the grass is not much of a problem as we have a lot of width it is suprising how many times people land a fraction short and just clip the edge of the field and tip over. This is much worse when the crops are fully grown. Sometimes they actually touch down two or three yards short. Back to basics, how do we get better at things, practice practice practice. Pick a handy trainer, your Baron would do it, and fly nothing but takeoff, circuit (or maybe two), landing, and I mean nothing but that, for the entire day. Over and over until you are literally beyond sick of doing takeoffs and landings. Get the pattern burnt into your brain with that model. I'd accept the odd low pass if you abort the landing! Come back next week when the wind is in the other direction and do it all again. Next, bring your Acrowot, and do it all over. Yesterday I took my trainer to the patch and flew almost nothing but touch and goes for five flights. So I do do what I'm suggesting! As I was on my own I was able to wander about, in order to practice different direction approaches (right to left, left to right), and use both runways to practice crabbing in with crosswind. FWIW my patch - two strips at right angles, pick the best one for the wind, they're both about 30m x 4m, if that. Hedges about 10m beyond the long direction on one runway. I can't afford bad landings - anytime but summer the ground and grass mean a bad landing sends me home to fix damage! You have my sympathy David. Many a time I have landed on the runway threshold, thinking my plane to be closer than it actually was. There is a small trick that can help. Clench your fist and stick the thumb up. Hold out your arm and place the top of the clenched fist along the horizon line. The tip of your thumb is then at about 6 degrees above, which is the best angle of approach. The plane should stay at this 'height' all the way in to touchdown, which should be close to you and hence on the runway. It sounds a bit crude but it does work. Incidentally, if you want a 3 degree flat approach, the knuckle of yuor thumb is about right. The worst case for depth judgement is when you're standing close to the runway. I remember flying quite a large model for a clubmate, with him standing alongside me, along with the experienced original builder/owner. I had been flying some small models beforehand and all three of us were quite happy with the approach which was, of necessity, aiming to maximise the length of the runway. All three of us had a sudden shock when the model stopped abruptly as it hit a wire cable in the hedge line! Happily the model wasn't seriously damaged and some years later, I was happy to become its current owner. Is there any possibility of standing a little further back from the runway? For some reason, I'd fallen into the trap of setting a too high and deep downwind leg and as a consequence was finding my landings were becoming rather erratic and stressful. Took me a while to correct things. A bit like the 'yips' experienced by golfers (mainly putting) and other sportsmen....... Wikipedia...Yips - The condition occurs most often in sports in which athletes are required to perform a single precise and well-timed action such as golf and darts. it probably differs person to person, but for me, when on final approach breaking the 'fixation' on the model by two or three glances at the intended touchdown point and then back to the model gives me a much better indication of the line of approach and the depth / distances involved. rarely need to do this at my regular site but when guesting at an unfamiliar site it usually avoids embarrassment. This is a massive problem where I fly too - its how my Yak ended on the top of a large tree I also have a slope to contend with. "rudder control is most intuitive when the pilot is behind the model"
I realise this might be contentious to some, and a bit of a can of worms and all that, but, the very core of learning to pilot a model involves being able to fly it in all directions, including towards yourself. Otherwise you are a passenger for 50% of the flight and that is asking for disaster. Even if you have zero ambitions regarding aerobatic flight, you absolutely need to be in complete control of an upright model in a normal flight attitude, coming towards you. Only being able to fly going away from yourself isn't solo competent, I would contend. I'm not sure about this. Placing the pilots near the threshold exposes them to models passing at flying speed and quite likely head height while they are concentrating on flying their own models rather than being on the ground and decelerating as they pass. During take-off, models are likely to be in contact with the ground as they pass the pilot box and self-preservation is a powerful safety aid should an unfortunate situation start to develop! For me, I find it easier to judge aircraft attitude during the take-off run and initial climb out if I'm standing to the side. Are you saying you're unable to detect whether a model is tracking straight on the runway from such a position? Not to wear Varifocal glasses , ??? All Forum Topics > Hints and Tips > Depth Perception.